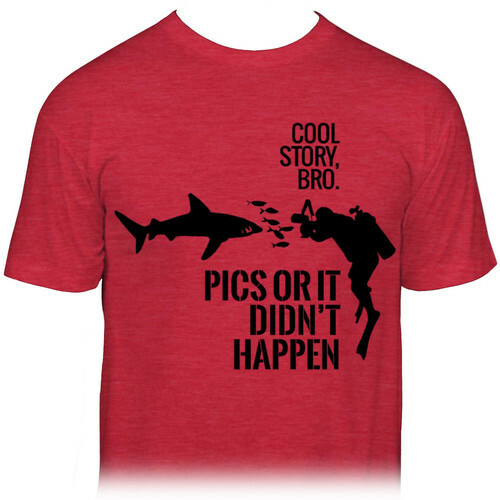 The Cool Story, Bro "Pics or It Didn't Happen" Diver Shark T-Shirt perfectly sums up why Ikelite makes the products it does. This soft and comfortable 3.7-ounce poly/cotton blend shirt features a diver taking an uncomfortably close pic of a shark with the simple statement "Cool story, bro. Pics or it didn't happen." Made in the USA, the medium size heather-red shirt runs slightly small by current sizing standards so if you want a roomier fit, Ikelite recommends that you size up so you'll be comfy in it. Box Dimensions (LxWxH) 11.5 x 10.9 x 0.75"